Brighton Pier is probably the most popular and visited attraction in Brighton. 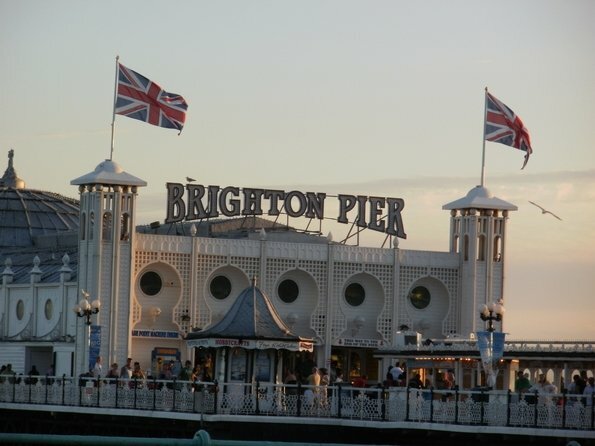 It is as well known as The Place Pier or Brighton Palace Pier. Built in 1823 Brighton Pier was an Old Chain Pier which was used as a landing stage for passenger boats which sailed from Dieppe, France. The Pier was hit by many storms in a 10 year period causing damage and finally the pier was sold to Marine Palace & Pier Company in 1889. In December 1889 the pier was destroyed in a storm. Brighton Palace Pier was finally opened in a big ceremony on the 20th May 1899 costing 27,000 to build. Pier was the first in the country which introduced new vision of gaming and rides. A concert hall was opened two years later and then this had become a theater. The Palace Pier carried on introducing more entertainment facilities which includes a bandstand. The bandstand was the stage for free concerts in summer. For national security measures The Palace Pier was closed in May 1940.In 1984 major changes were presented such as free admission, free deck chairs, new food outlets on and a traditional fish & chips restaurant. At the present there are 67,000 lights on Brighton Pier and most of them have been changed over for long life, energy saving bulbs.